Final preparations are underway in Brazil as it gears up to host the FIFA World Cup - and the atmosphere is already beginning to reach fever pitch. Hundreds of thousands of football fans from all four corners of the world are expected to touchdown in the country for the iconic tournament, which is now just a matter of weeks away. Brazil, playing in their own backyard, are one of the favourites to make it all the way to the final and lift the famous trophy, so visitors should savour the feel good factor sweeping the nation and get involved in the festivities. The tournament is also the perfect excuse to explore all the attractions that this stunning country has to offer. Rio de Janeiro will be the main city for the World Cup, with its Maracana stadium hosting the final and six other matches. 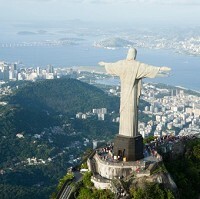 Here fans should definitely take advantage of the chance to relax on Copacabana beach, while a trip to see Christ the Redeemer up close is also not to be missed. Salvador, which will host six matches during the tournament, is another great spot to get a feel for Brazil. It is home to some of the finest colonial architecture in South America, not to mention the gorgeous bay of Porto da Barra. Other attractions across the country include the impressive Ibirapuera Park in Sao Paulo, which is often compared to Central Park in New York, and the dramatic canyons of Aparados da Serra in Porto Alegre. Brasilia, the planned capital of Brazil that was built from scratch in the late 1950s, is also well worth a visit. If you're lucky enough to have secured tickets to the World Cup, make sure you purchase adequate travel insurance before you leave. This will provide you with peace of mind to enjoy the football and the rest that Brazil has to offer.